The Curtiss JN-4 "Jenny" is a series of biplane aircraft built by the Curtiss Aeroplane Company of Hammondsport, New York, later the Curtiss Aeroplane and Motor Company. The Curtiss JN series (the common nickname was derived from "JN") was produced as a training aircraft for the U.S. Army although the "Jenny" became the "backbone of American post-war aviation." 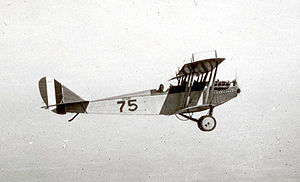 Curtiss combined the best features of the model J and model N trainers, built for the Army and Navy, and began producing the JN or "Jenny" series of aircraft in 1915. Curtiss only built a limited number of the JN-1 and JN-2 biplanes. The design was commissioned by Glenn Curtiss from Englishman Benjamin D. Thomas, formerly of the Sopwith Aviation Company. The JN-2 was an equal-span biplane with ailerons controlled by a shoulder yoke located in the aft cockpit. It was deficient in performance, particularly climbing, because of excessive weight. The improved JN-3 incorporated unequal spans with ailerons only on the upper wings, controlled by a wheel. In addition, a foot bar was added to control the rudder. The 1st Aero Squadron of the Aviation Section, U.S. Signal Corps received eight JN-2s at San Diego in July 1915. The squadron was transferred to Fort Sill, Oklahoma, in August to work with the Field Artillery School, during which one JN-2 crashed with a fatality. The pilots of the squadron met with its commander, Capt. Benjamin Foulois, to advise that the JN-2 was unsafe because of low power, shoddy construction, lack of stability, and overly sensitive tail rudders. Foulois and his executive officer Capt. Thomas D. Milling disagreed, and flights continued until a second JN-2 crashed on September 5. The JN-2 was grounded until October 14, when it was modified to become a JN-3, two new models of which the squadron received in early September. In March 1916 the eight JN-3s were deployed to Mexico for aerial observation during the Pancho Villa Expedition of 1916-1917. The Curtiss JN-4 is possibly North America's most famous World War I aircraft. It was widely used during World War I to train beginning pilots. The Canadian version was the JN-4 (Can), also known as the "Canuck", and was built with a control stick instead of the Deperdussin control wheel used in the regular JN-4 model, as well as usually having a somewhat more rounded rudder outline than the American version. The U.S. version was called "Jenny". It was a twin-seat (student in front of instructor) dual control biplane. Its tractor prop and maneuverability made it ideal for initial pilot training with a 90 horsepower (67 kW) Curtiss OX-5 V8 engine giving a top speed of 75 miles per hour (121 km/h) and a service ceiling of 6,500 feet (2,000 m). The Curtiss factory in Buffalo, NY was the largest airplane factory in the world. A seaplane version was built for the Navy which was so modified that it was essentially a different airframe. This was designated the N-9. The final version of the aircraft was the JN-6. In U.S. Army Air Service usage the JN-4s and JN-6s were configured to the JNS ("S" for "standardized") model. The British used the JN-4 (along with the Avro 504) for their primary World War I trainer; Canadian Aeroplanes Ltd. produced them in Canada. Many Royal Flying Corps pilots earned their wings on the JN-4, both in Ontario and in Texas. Most of the 6,813 built were unarmed, although some had machine guns and bomb racks for advanced training. None saw active service. After World War I, hundreds were sold on the civilian market, one to Charles Lindbergh as his first aircraft. 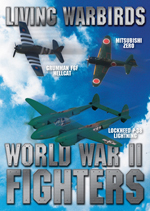 The plane's slow speed and stability made it ideal for stunt flying and aerobatic displays in the barnstorming era between the world wars, with the nearly-identical Standard J-1 aircraft often used alongside it. Some were still flying into the 1930s. 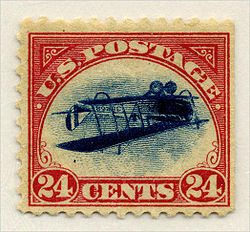 Picture - Printed upside-down in error, the Curtiss JN-4 appears on a famous stamp, known as the "Inverted Jenny". The Inverted Jenny is a United States postage stamp of 1918 in which a Curtiss JN4 aircraft in the center of the design was accidentally printed upside-down. It is one of the most well-known stamps in philately. In 1921, Lee De Forest filmed a short film Flying Jenny Airplane in his Phonofilm sound-on-film process. 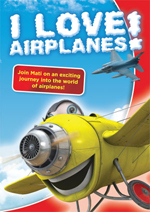 The film depicted a JN-4 flying, and recorded the sound of the plane as well. JN-4A - Production version of the JN-4, 781 built. JN-4B - This version was powered by an OX-2 piston engine, 76 built for the US Army, nine for the US Navy. JN-4C - Experimental version, only two were built. JN-4Can Canuck - Canadian-built version, 1,260 built by Canadian Aeroplanes Ltd. Used a more rounded rudder shape. JN-4D - Improved version, 2,812 built. JN-4D-2 - One prototype only. JN-4H - two-seat advanced trainer biplane, 929 built for the US Army. Notable for introducing the use of the Hispano-Suiza 8 V-8 engine for greater power and reliability. JN-4HT - Two-seat dual-control trainer version. JN-4HB - Combing trainer version. JN-4HG - Gunnery trainer version. JN-5H - One-off advanced trainer biplane, only one was built. JN-6H - Improved version, with strengthened aileron control structure. 1,035 built for the US Army and five for the US Navy. JN-6BH - Bomber trainer version. JN-6HG-1 - Two-seat dual-control trainer version. JN-6HG-2 - Single-control gunnery trainer. JN-6HO - Single-control observer trainer version. JN-6HP - single-control pursuit fighter trainer version. 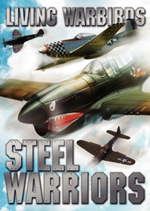 JNS - Between 200 and 300 US Army aircraft were upgraded and modernized, during the post-war years of the early 1920s. Ericson Special Three - Some reconditioned aircraft built by Canadian Aeroplanes Ltd were fitted with a third cockpit. Twin JN - Enlarged twin-engined version of the JN-4, powered by two OXX-2 piston engines. Eight built. No. 3 Squadron AFC - Used for training. About 50 Jennys survive in museums and with private owners. A 1917 JN-4D is on permanent display at the Museum of Science and Industry in Chicago. It is displayed upside-down next to a wraparound balcony, and details of the cockpit can readily be seen. JN-4D, USAAC 2805 is on display at the National Museum of the United States Air Force in Dayton, Ohio. It was obtained from Robert Pfiel of Taylor, Texas in 1956. The aircraft is displayed in the Museum's Early Years gallery. JN-4D Signal Corps 2975, c/n 450, built 1918, is on display at the Virginia Aviation Museum, Richmond, Virginia, on loan from Ken Hyde, Warrenton, Virginia. JN-4H U.S. Navy 6226 is still flightworthy and on display at the Old Rhinebeck Aerodrome in Rhinebeck, NY. It is still occasionally flown during airshows, and is powered with a rare Hispano-Suiza 8 V-8 engine. JN-4D U.S. Army Air Corps "2525" on display at the Call Aviation Field Memorial Exhibit at Kickapoo Air Park in Wichita Falls, TX. It is flown on the first Saturday of each month, weather permitting. JN-4D c/n. 4904. EAA AirVenture Museum, Oshkosh, Wisconsin. The Cradle of Aviation Museum on Long Island has two Jennys on display. One is the aircraft owned by Charles Lindbergh in which he barnstormed long before his transatlantic flight. A JN-4D built in 1917 has been fully restored to flying condition and is on display at the Golden Age Air Museum in Bethel, PA at Grimes Airport. Auliard, Gilles. "Maiden of the Skies." Air Classics, Volume 45, No. 4, April 2009. Angelucci, Enzo. Great Aeroplanes of the World. London: Hamlyn, 1973. 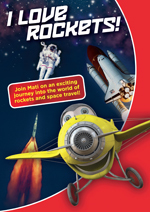 ISBN 0-60038-663-5. House, Kirk W. Hell-Rider to King of the Air. Warrendale, PA: SAE International, 2003. ISBN 0-7680-0802-6.